Warm, intimate, and cosy, The Conversation Garden certainly was all of these things and more. Simply beautiful, this garden hosted warm colours and lots of round structure and space; a place for talking, and sharing food and company. Paal allowed me to wander free around his design, and it was even more spectacular inside – it felt just so comfortable and instantly calming. The curving lines and spirals directed your eyes towards three circular meeting places – the conversation pit and fire ball, the dining table, and relaxation spa. The garden flows from these points over the interesting weathered steel retaining the slabs of lawn. The plant choice was quite simple and Paal used plants with structured forms and special focus on foliage colour – magnolia, lonicera, and liquid amber. 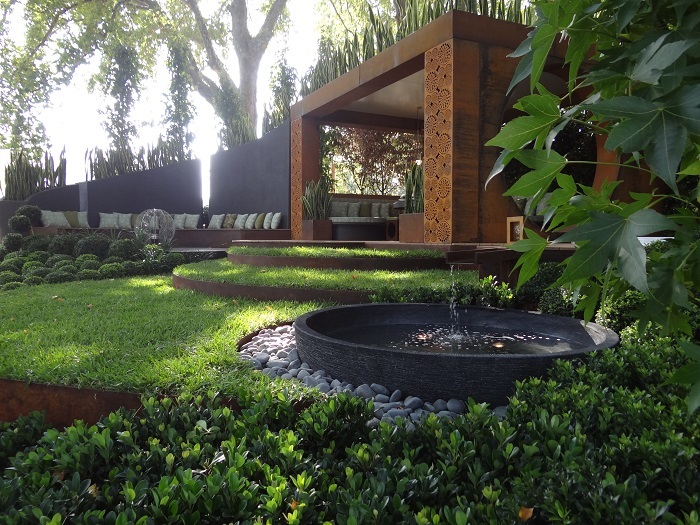 I loved how the buxus were trimmed into little spheres to compliment the design. Entanglements crafted the striking lazer-cut outdoor living area, where even the cushions hosted the circle detail. Paal also let me know that he is affiliated with the Australian Suicide Prevention Foundation “Hold onto life”. This was what lead him to design a garden which identified the importance of talking to each other. Proceeds from a wishing well in the garden were donated to the Foundation. A dynamic design that encourages people to meet and enjoy other’s company, and a place to stimulate the senses, refresh and rejuvenate. This garden was just wonderful, and it’s no wonder it won Gold this year at MIFGS.